I bought a new bass last week. I wasn't intending to, but the guy won't be selling them for much longer and when even your wife says "wow, that's a really nice bass, you should get it" there's no point in resisting. Technically I can't afford it, but we have savings and I'll be making regular payments back into the savings until it's paid off... yes, I could have saved up for it but if I had it might have gone (and I certainly wasn't prepared to risk paying inflated prices on eBay). Isn't it lovely? 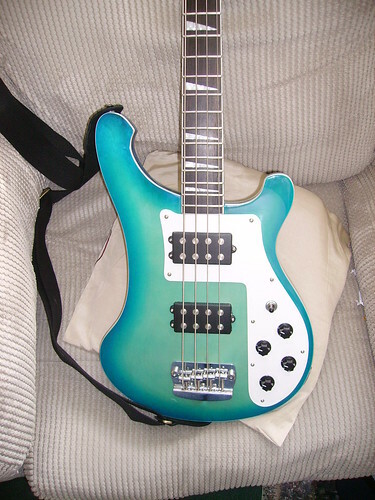 Of course this being a guitar modding blog I can't just say I'll leave it as is, can I? I've already ordered a new nut (because the stock one is as naff as stock nuts usually are) and I think I might replace the plain white scratch plate with a nice cream/black/cream 3-ply job at some point in the future. Homebuilt Effects and Bass Cabinets.